The Metropolitan Transportation Authority (MTA) today announced that it is testing two prototypes of powerful – but portable – track vacuum systems that can be quickly deployed, operated from platforms, and moved easily from one station to the next. The new units are part of the MTA’s ongoing Track Sweep initiative, which is a multi-pronged plan to dramatically reduce the amount of trash on subway tracks, in the process improving the station environment, and reducing track fires and train delays. The first unit is currently being tested, while the second will be deployed within the next two weeks. The prototype units are both powered by lithium iron phosphate batteries with a battery management system that protects the batteries and load from over current, and both can be moved from station to station on a conventional revenue train. The tests are scheduled to last approximately 30 to 45 days. Assuming the successful completion of the tests, the MTA will move aggressively to acquire and deploy additional units. • In Manhattan from Lexington Av/53 St E, M on the Queens Boulevard E, F line to W4 St-Wash Sq A, B, C, D, E, F, M on the Sixth Avenue B, D, F, N and Eighth Avenue A, C, E lines, which is a chain of 15 stations. • In Queens along the Queens Boulevard corridor from Jamaica-179 St F to Queens Plaza E, M, R, which is a chain of 20 stations. Operation Track Sweep (view video here: https://youtu.be/CGIODTxfD_w) is a multi-pronged plan to dramatically reduce the amount of trash on subway tracks, and, in the process, improve the station environment, and reduce track fires and train delays. Phase 1 of the effort, which focused on establishing a more aggressive schedule for cleaning tracks at stations, launched in June 2016. Phase 2 followed in September, and involved 500 workers removing trash and debris from the tracks at all of the system’s stations. In June 2016, the MTA implemented a new cleaning schedule that reprioritizes stations based on the amount of trash usually removed, and increases the frequency of track cleaning. The MTA now cleans the tracks at 94 stations every two weeks, up from cleaning tracks at 34 stations every two weeks. In September 2016, the MTA launched an intensive two-week, system-wide cleaning during which more than 500 workers removed trash and debris from the tracks at all of the system’s 469 stations – more than 10 miles of subway station track. 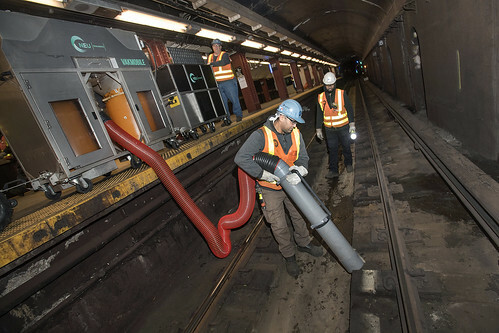 The MTA has begun testing two powerful – but portable – track vacuum systems that can be quickly deployed, operated from platforms, and moved easily from one station to the next. In addition, the MTA has ordered a trio of powerful new track vacuum trains, with the first train arriving in 2017, followed by the second and third, which will arrive in 2018. The MTA is also purchasing 27 new refuse cars to move debris out of the system more quickly and support the new expanded cleaning effort. The cars are equipped with special railings to secure and transport wheeled garbage containers that are collected at subway stations.